Compare Hitch Mount Bike Racks: Allen Sports Deluxe or Yakima RidgeBack? If you like to use your bicycle as often as possible, you have probably considered getting a bike rack for your car so you can take it anywhere you like. In particular, if you have a family, and you need to carry a number of bikes, there is no way you will be able to take apart all the wheels and carry them inside the car. A multiple-bike rack is what you will need. Nowadays, you can find a number of different types of bike racks for your car, the most commonly used ones being trunk mount bike racks, roof mount bike racks and hitch mount bike racks. They allow loading and unloading bikes at a lower height than roof mount racks. Vehicle can still access low clearance areas like garages or certain drive-throughs. Vehicle roof is left free for carrying other stuff such as skis. Roof-rack decreases your MPG (miles per gallon) since your car will be less aerodynamic. 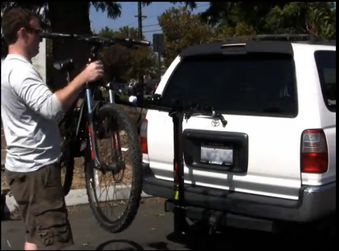 They do not require many attach points on the vehicle like trunk mount bike racks do. They are more secure than trunk mount bike racks . They allow carrying more bikes (the maximum for trunk mount bike racks is usually 3 bikes, while hitch mount bike racks can carry up to 5). They can be installed even if there is a spoiler on the vehicle (a spoiler is a device that modifies air flow in order to increase fuel efficiency and improve handling in automobiles). They requires the installation of a hitch. But that can also be seen as an advantage, as the hitch can also be used for towing other stuff like a caravan. Access to the rear of the vehicle may be more difficult. However, nowadays you can find hitch mount racks that have tilting frames that allow opening of the back door for easy access to the rear of the vehicle. Racked bikes may obstruct visibility through the rear window. However, nowadays you can find hitch mount racks that allow placing of the bikes low enough that adequate visibility through the rear window is still available. Given the above considerations, for many, a hitch mount bike rack is the preferred choice. This article will compare Allen Sports Deluxe and Yakima RidgeBack hitch mount bike racks. These were not just the most popular in their category among Amazon customers at the time this article was written, but they have also received excellent reviews from most Amazon buyers (an average of 4.5 stars each out of 5 stars!). Selected Hitch Mount Bike Racks on Amazon. Allen Sport Deluxe model id 5x2RR is a generic form that becomes 522RR for the 2-bike rack, 532RR for the 3-bike rack, 542RR for the 4-bike rack, 552RR for the 5-bike rack. Yakima RidgeBack model id 800245x is a generic form that becomes 8002457 for the 2-bike rack, 8002458 for the 4-bike rack, 8002459 for the 5-bike rack. Even though Yakima RidgeBack does not have a 3 bike rack, the 4 and 5 bike racks can of course be used to carry 3 bikes if desired. Allen Sports 2–bike rack: 1.25" and 2". Allen Sports 3–bike rack: 1.25" and 2". Allen Sports 4–bike rack: 2" only. Allen Sports 5–bike rack: 2" only. Yakima RidgeBack 2-bike rack: 1.25" and 2". Yakima RidgeBack 4-bike rack: 1.25" and 2". Yakima RidgeBack 5-bike rack: 1.25" and 2". (Note that to provide the choice of 1.25" and 2", the 1.25" hitch comes with a sleeve that fits over the tongue to make it 2". Removing one screw reverts it back to 1.25"). The main masts of both racks tilt back about 45 degrees giving enough clearance for easy vehicle rear access. Allen Sports Deluxe bike racks have a cradle system with individual tie-down rubber straps that secure and protect separately each bike. Yakima RidgeBack uses their proprietary ZipStrips which are plastic clips to secure individually bikes to the rack. On the Yakima RidgeBack rack, there is red knob that you need to turn to fasten the rack to the hitch. There is a key that is provided to lock the red knob to protect the rack against theft and for increased security. Once locked, the red knob spins free so you can't disconnect the rack from the hitch. To attach the rack to the hitch, Allen Sports Deluxe has a no-wobble bolt with a nut that eliminates movement of rack inside hitch. Yakima RidgeBack has a tool-free speed knob that quickly tightens and secures the rack to the hitch. The knob also has a key for locking and securing further the rack in the hitch. Once locked, the knob just spins if someone tries to turn the knob. The adapter bar is used on bikes without the horizontal top bar (such as woman's bikes). Yakima RidgeBack's bike-lock cable (known as the HandCuff ) allows the locking of the bikes to the hitch rack for protection against theft. Prices depend on the bike rack size and can vary at any time. The Amazon prices shown were in effect at the time this article was written and may have changed. For exact prices, please refer to the Amazon products section below. Note that the Amazon price often includes a generous discount to the list price. If a discount exists, both the Amazon price and the list price will be displayed when you click the Amazon product link images below. The following videos show how the Allen Sports Deluxe and Yakima RidgeBack hitch mount racks are installed and how they work. The videos show various aspects of the racks including the tilt-back masts. Note: Though the videos are respectively made for the 3-bike Alllen Sports Deluxe rack and the 4-bike Yakima RidgeBack rack, they are applicable to all sizes of these racks. So, which hitch mount bike rack is best for you? The Yakima RidgeBack racks are heavier and therefore seem to be sturdier. They also have a more attractive design. The Yakima RidgeBack racks require no assembly before connecting it to the hitch receiver. On the other hand, the Allen Sports Deluxe racks require some assembly such as connecting the hitch insert to the main post and attaching the bike carry-on part to the post, before the unit is ready to be connected to the hitch receiver. See the above videos for an illustration of assembly and installation. Once connected to the hitch receiver, the Yakima RidgeBack rack can be locked with a key protecting it against theft. The Allen Sports Deluxe rack can not be locked, the safety bolt has a nut to secure it, but that can be easily removed with the right tool. In addition, Yakima optionally provides specially designed HandCuff cables to attach each bicycle to the rack for additional protection. On the Allen Sports Deluxe racks, the straps used to secure the bikes on the cradles are made of rubber, while Yakima RidgeBack racks use hard plastic clips which are easier too use and probably longer lasting. These plastic clips simply snap in place, and you don't have to wrestle stretching them over the bikes each time you load and unload them. The Yakima RidgeBack has an ergonomic design. The two levers used to operate the rack are both located at the top of the unit. This is very convenient as you don't need to bend down to do anything. Finally, many Allen Sports Deluxe racks users have reported that they had to use Velcro to attach the bike wheels to the frame so they won't move while the car is driving and to prevent bike-to-bike contact. No such comments were made by Yakima RidgeBack users, meaning that the design of the Yakima RidgeBack ensures more stable bike positioning on the rack. The Yakima RideBack rack arms are equipped with fully adjustable, anti-sway cradles for superior protection and stability, eliminating bike-to-bike contact. We prefer the Yakima RidgeBack over the Allen Sports Deluxe, and if you can afford it, you should go for it. However, as mentioned earlier, the Allen Sports Deluxe rack is also an excellent product that you will not regret buying. Please click the bike rack of your choice below for price information or to purchase.